Camillus New York Real Estate - Contact Bob McTague at 315-882-6610 – 159 Shetland Place – Welcome Home! Why wait to build when you can have the home you want NOW with this home built in 2011! 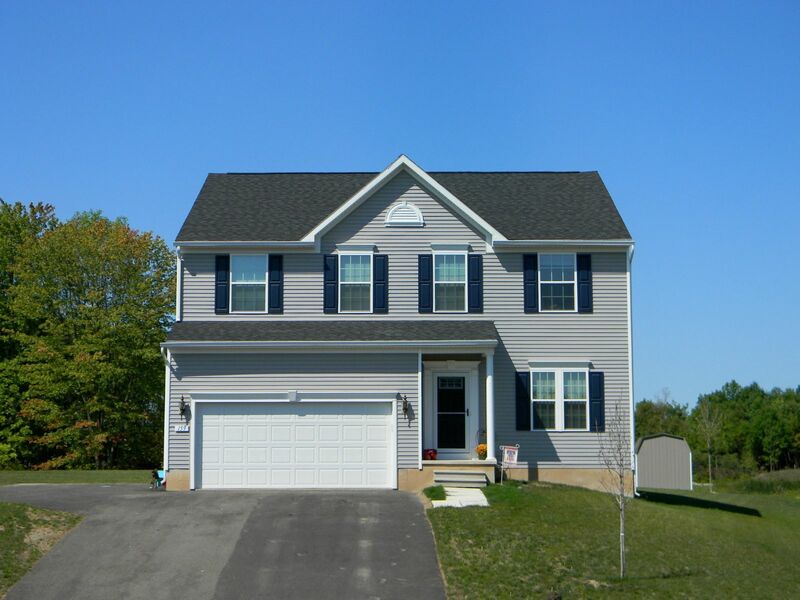 This beautiful home offers stylish and spacious floor plan with quality upgrades throughout. Relax in the cozy and inviting sun filled family room, which offers a gas fireplace. Entertain in the formal dining room. Gather in the open eat in kitchen that invites you to granite counter tops, hardwood floors, and upgraded cabinetry. A sun splashed sun room, study, and mud room with hardwood floors, and a half bath complete the first floor space. The second floor provides a Master bedroom with dual walk in closets, a master bath with tile floors, granite counters, and a stand up shower and soaking tub. There are two other ample sized bedrooms, a loft that could be converted to a fourth bedroom, and a second full bath. The basement is very large and dry with a plumbing for a full bath and egress for future bedrooms. The exterior features an open but private large flat backyard, a 10 X 14 foot shed, extended driveway w/side parking, and a two car garage. Centrally located in the desirable and sought after "Country Oaks" subdivision located in the popular West Genesee school district, and close to schools, parks, shopping, restaurants, and highways. This well 2,688 sq ft also is equipped with a tank less hot water heater, central A/C, and has ceiling fans throughout. Great opportunity to own a new home that is move in ready. Call today for more information!